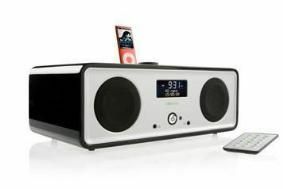 Vita Audio R2i system adds DAB+ radio and iPod dock | What Hi-Fi? The new version costs from £280 and has redesigned audio circuitry and a bigger, clearer screen. The cabinet is hand-crafted from high-density fibreboard and is available in three finishes: Rich Walnut veneer (£280) and Dream White and Midnight Black Gloss (£300). All dockable iPods from January 2004 will work with the built-in dock; earlier models and the iPod Shuffle can be connected via the front or rear auxiliary inputs, as can other MP3 players. Power output is a claimed 20 watts, and the unit is equipped with enhanced 3D sound processing and selectable tone EQ settings. Stereo sound is provided by two 3.5in drive units. You also get a stereo headphone output, a RotoDial controller on top of the system, remote control, two pairs of gold-plated phono inputs and clock and alarm functions. The Vita Audio R2i will be available from July through selected stores including John Lewis, Selfridges, Harrods, House of Fraser and The Conran Shop.